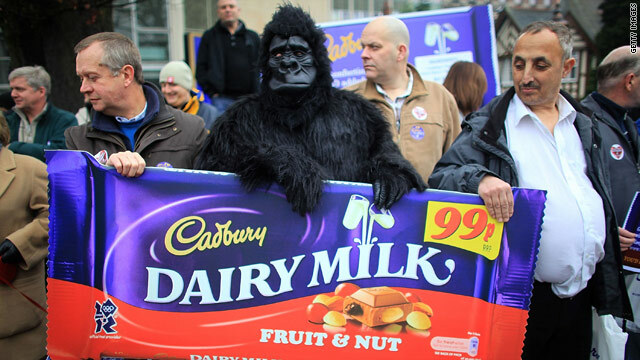 Cadbury employees protest in December 2009 against Kraft's takeover bid for the UK candy maker. UK candy maker Cadbury rejects offer, says terms remain "unchanged, derisory"
London, England (CNN) -- Kraft's fresh bid for suffered a double blow Tuesday as the improved offer was dismissed by the British candy company and criticized by billionaire investor Warren Buffett who controls an influential stake in the U.S. food giant. Buffett said he had voted against Kraft's plan to issue new shares as part of a cash and stock offer worth approximately $16 billion, warning it would hurt shareholders, Fortune reported. Buffett's Berkshire Hathaway company owns 138 million Kraft shares, making it the largest shareholder in the foodmaker with a 9.4 percent stake. But in a statement, he warned Kraft's move for Cadbury risked undervaluing Kraft stock. "Kraft stock, at its current price of $27, is a very expensive 'currency' to be used in an acquisition," Buffett said. "In 2007, in fact, Kraft spent $3.6 billion to repurchase shares at about $33 per share, presumably because the directors and management thought the shares to be worth more." Earlier, Illinois-based Kraft said it would use the proceeds from the sale of its U.S. pizza business to Nestle to increase the cash element of its Cadbury offer. Under Kraft's offer of a partial cash alternative, Cadbury shareholders could receive cash as well as Kraft shares if they accept Kraft's deal. "Kraft Foods is doing this because of the desire expressed by some Cadbury security holders to have a greater proportion of the offer in cash," Kraft said in a statement. The maker of Jell-O, Cool Whip, Oreo cookies and Kraft Macaroni & Cheese also extended the Cadbury offer to February 2. The original bid had expired Tuesday. Cadbury, which rejected Kraft's previous two deals, rejected the new offer Tuesday. "Kraft has once again missed the point," a Cadbury spokesman told CNN. "Despite this tinkering, the Kraft offer remains unchanged and derisory, with less than half the consideration in cash." There had been rumors that Swiss firm Nestle, which already has a chocolate and confectionery unit, would step in and make its own offer for Cadbury. But Nestle put an end to those rumors Tuesday by issuing a statement saying it had no intention to make an offer for the British company. Instead, Nestle said it had bought Kraft's frozen pizza business in the United States and Canada for $3.7 billion. The unit includes brands like DiGiorno, Tombstone, and California Pizza Kitchen. "The acquisition brings leadership in the frozen pizza category, where Nestle only had a minor presence until now, and builds on Nestle's existing pizza know-how and operations in Europe," Nestle said in a statement Tuesday. "It is a natural fit with Nestle's focus on delivering convenient, premium, wholesome and nutritious frozen food for consumers around the world." Nestle already had a presence in American frozen food aisles with ready-meal brands like Stouffer's, Lean Cuisine, and Hot Pockets. The proceeds from the sale allow Kraft to offer more cash to Cadbury shareholders -- an additional 60 pence (96 cents) per share, Kraft said. Kraft originally offered Cadbury shareholders 300 pence ($4.81) and 0.26 Kraft shares for each share of Cadbury they own. Kraft said it will announce more detailed terms by January 19.